You Can Make A Difference for Only Php10 or $0.22 a day! What is Php10 a day? Or Php50 a week? ONE Jollibee or McDonald's value meal is one WEEK'S lunch of a student. What is $0.22 a day? $3.75 a month? ONE Starbucks coffee is one MONTH'S lunch meal of a student. These children need your help! Tapulanga Foundation's Lunch Meal Program provides free lunch meals (rice and viand) every school day for a whole year to the students. 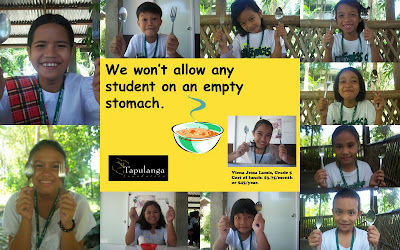 For only Php2,000 or $45, you can already sponsor a student's lunch meal for an entire school year. We have at least 100 kids whom we'd like to provide free lunch in school. HELP US MAKE THIS HAPPEN! Please join us in the 3rd Annual Sharing Hope benefit for the educational, healthcare and micro-credit programs of Tapulanga Foundation in the Philippines. We will have a Filipino cuisine buffet dinner, Silent Auction, Raffle, Door Prizes and more! Mic Golez who runs the Foundation in the Philippines will be at our event to share about the Foundation's activities in the past year and hopefully have a chance to meet some of you that evening. We are offering Table Sponsorships (for 10 people) at $350 and $500 (includes a 1 year scholarship in your name) per table. Please let us know if you would like to sponsor a table for your family and/or your business. We are also having a silent auction and if you donate an auction item you get 2 tickets to our event. Please contact Robin (robin@percworks.com) or Kate (kate@hoffmanobgyn.com) if you are interested in sponsoring a table and/or donating a silent auction item. For more information about Tapulanga Foundation, visit www.tapulanga.org. Watch for invitation with RSVP information in the mail. We hope that in these times of economic uncertainty you can join us in helping to give these kids a chance for a better life.